Photo-sharing site Flickr is great for uploading and exchanging photos, but sometimes it’s tricky to find exactly what you’re looking for. Connected Flow’s newly-released Viewfinder 1.0 aims to make searching Flickr as friendly—if not friendlier—than searching your own Mac. It’s easy enough to pop a keyword into Viewfinder and have it return thumbnails of the results, but the program’s real power comes from the ability to limit your search—most importantly, by the photo’s license. You can specify Creative Commons, photos licensed for commercial use, and those which allow derivative works (or some combination of the three). 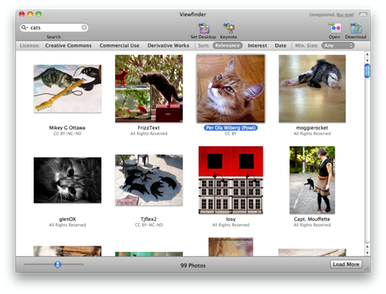 If you’re looking for images of a particular size, Viewfinder lets you do that too. The combination of those two features makes this a perfect tool for those looking for cute cat photos to legally insert into their blog posts or presentations. When you’ve found your picture, Viewfinder can download it and even lets you copy a variety of useful information, such as a pre-formatted attribution string, the Flickr URL (in full or shortened forms), or a link to the full-size image. The program also lets you easily drop an image into Keynote or set it as your desktop picture. Viewfinder requires Mac OS X 10.6 or later and Keynote ’08 or later if you want to use its related functionality. At the moment, it costs £15 ($25), but that price will rise to £19 ($31) when Viewfinder 1.1 is released. A non-expiring demo is available, but it delays downloads by 30 seconds and can only download two photos per launch.